Deep beneath the surface of endless partisan wrangling between the White House and Congress is the Social Security debate. And while it’s considered one of the most complex and intricate policy issues in Washington, it’s also one of the more consequential discourses in modern American politics. It’s simple: the U.S. population is rapidly aging. The more it ages, the more concerns over issues such as Medicare and Social Security nudge themselves into the forefront of election cycle talking points. According to the Census Bureau, there are now 41 million Americans aged 65 and older. That growing bloc skyrocketed more than 15 percent between 2000 and 2010 — compared to an overall less than 10 percent increase for the entire U.S. population. 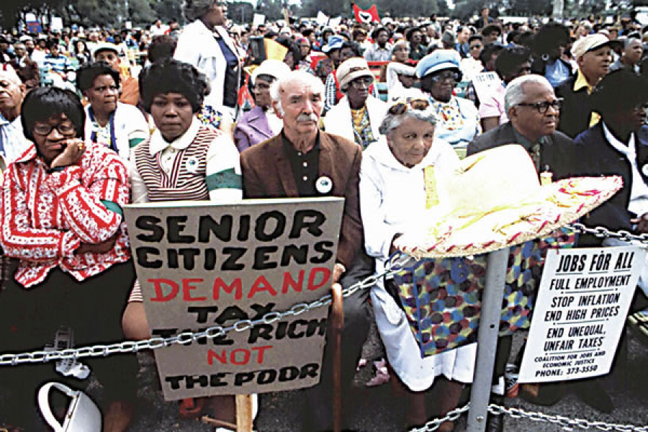 Senior citizens now constitute 13 percent of the total population, outpacing their 12 percent in 2000 and 4 percent at the beginning of the 20th century. These population trends provide the background noise for an endless debate on the viability and future of Social Security. Stakes are high, considering more than 56 million people, or one in every six Americans, collect some type of Social Security benefit. More than three-quarters of recipients are retirees or elderly widows or widowers, in addition to nearly 20 percent who receive disability insurance and another four percent who are the younger survivors of deceased workers, according to the Center for Budget and Policy Priorities. It amounts to nearly 20 percent of the population that’s on Social Security. Critics of Social Security view it as a gigantic welfare program or entitlement that’s sapping the country’s economic future. Such rampant opposition to Social Security has prompted the Obama White House to meet conservatives in the middle on the issue, with a proposal from the president to change how annual benefits are calculated. Politically, Obama’s Chained CPI proposal seeks to placate budget hawk Republicans who wouldn’t mind doing away with Social Security altogether. Fiscally, it could become another legacy feather in the cap for the president if it saves $230 billion over 10 years as planned — and further shaves a disastrous deficit created by his predecessor George W. Bush. But, hidden in the rhetoric and a string of meetings between Congressional negotiators attempting to hammer out a grand post-shutdown budget deal — in an effort to avoid yet another shutdown in 2014 — is the question of how the nation arrived here in the first place. Social Security, created in the mid-1930s as a poverty-busting program under President Roosevelt, was supposed to act as a virtual savings account. The expectation from most American workers is that Social Security should be sitting there waiting for them after dumping countless dollars into it from years of payroll taxes. So, how did it suddenly become a parasitic entitlement program munching off the federal budget? How does a savings account turn into a checking account in the red? In many ways, Social Security was intended to function as a stand-alone and self-financed program: it simply collects payroll taxes from workers and employers and pays benefits to eligible retirees, disabled workers, spouses and surviving spouses and children. That’s how Dan Adcock, Director of Government Relations and Policy, National Committee to Preserve Social Security and Medicare, sees it. “Rather than a drain on the economy, Social Security has been shown to have a multiplier effect, so that local areas see an impact from the program on their economies that can be as much as double what is paid in benefits,” saidAdcock. But, the Heritage Foundation’s Romina Boccia contends that the view of Social Security as a sort of retirement account is misguided and somewhat false. Boccia points out that, in reality, Social Security is operating on a pay-as-you-go system — whereby worker payroll taxes go toward paying the benefits of current retirees. In other words, a 35 year old worker who believes a portion of their payroll taxes is going into their own individual retirement account is being duped — that money is really going towards paying the benefits of their 85-year-old grandmother. Therein lays a mysterious question rarely raised in heated debates on the topic. So, basically, it was acting as its own self-sufficient, stand-alone until Congress went dipping into it? Jim Zelenski, a professor at Regis University in Denver, Colo., tries to explain while arguing that Social Security should be “completely off the table in any budgetary negotiations.” According to Zelenski, the Social Security Trust Fund has acted as a lender — its accumulated a $2.6 trillion surplus balance since 1984, largely from payments by anyone who has worked a day to 29 years since that time. Unknown to most, they’ve also been investing in U.S. Treasury Bonds. Hence, the government’s General Fund is the borrower — the U.S. Treasury has issued those bonds. “Enemies of Social Security are trying to trick citizens into thinking that the $2.6 trillion is an obligation of Social Security, but it’s the other way around,” said Zelenski. “In fact the $2.6 trillion is an asset of the Trust Fund. Social Security, incidentally, is prohibited from borrowing, at least that’s the view of Monique Morrisey of the Economic Policy Institute. Hence, Morrisey argues, it doesn’t really contribute to the public debt because it has dedicated revenues and must operate in a long-term balance. “Social Security only contributes to the public debt to the extent there’s a substantial transfer of general funds into the system, as happened during the recent temporary payroll tax cut,” Morrisey notes, referring to the Temporary Payroll Tax Cut Continuation Act of 2011, which extended the then 4.2 percent Social Security Old-Age, Survivors, and Disability Insurance (OASDI) tax rate for employees to wages paid after Dec. 31, 2011 and before March 1, 2012. That cut was extended again in 2012. In the meantime, aging population trends will send ripples across the electoral landscape. “If reforming Medicare and Social Security persist as policy issues, the votes of older persons may increasingly be affected to a much greater degree than in past elections,” said Dr. Robert Binstock of Case Western Reserve University. Fascinated by the rise of senior voters in Congressional midterms, Binstock dove into an intense examination of highly active and habitual swing voters that could determine electoral outcomes. “One can say with reasonable confidence that in their respective upcoming election campaigns, both parties will target older voters with Medicare and Social Security issues,” Binstock said. Polls are seeing it too. According to the most recent weekly YouGov/Economist survey, Medicare and Social Security tied for second to the economy when respondents aged 65 plus were asked to rank the importance of major issues today. But, when asked which issue is the most important to them, old-age respondents put Social Security at the top and the economy in second place. Political strategists, watching the polls closely, are sure to make note of that.